Plot: Two FBI agents, Fox Mulder the believer and Dana Scully the skeptic, investigate the strange and unexplained while hidden forces work to impede their efforts. Run Time: 14 Hr. 47 Min. The ninth and final season of The X Files had quite a number of plot strings to tie up, and while the producers did a satisfactory job with that (while still providing stand alone episodes featuring new paranormal phenomena), there seemed to be a feeling of incompleteness about the final season. The new characters introduced during the final two seasons weren’t left in satisfactory places, and the newest alien conspiracy storylines involving the super soldiers seemed rushed. The final season (and especially the series finale two-parter) did allow some beloved characters to make final appearances, but even that seemed to be pushed too quickly and not always satisfyingly. Primary among the central interests of the ninth season was the birth of Dana Scully’s (Gillian Anderson) baby boy William. It became clear fairly early on that he was an exceptional child and subsequent episodes during the season also made it a certainty that sinister forces (alien, governmental, or cultist-led) were out to either kidnap William or destroy him. 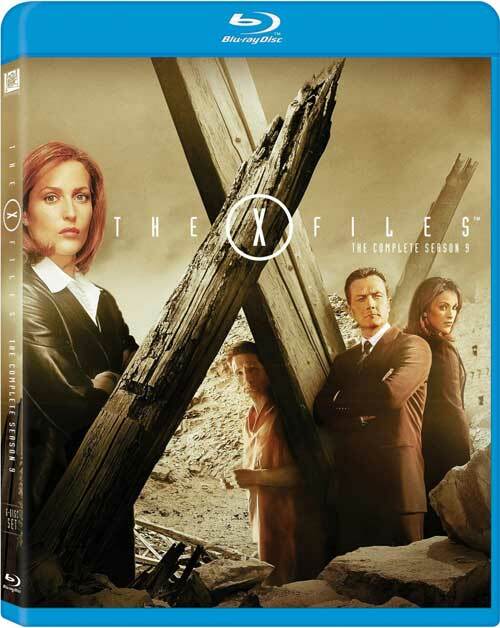 With Scully preoccupied with her child’s safety and now assigned to teaching forensics at the FBI Academy at Quantico, Monica Reyes (Annabeth Gish) was brought in full-time to join John Doggett (Robert Patrick) in the X Files office, still under the watchful eye of Assistant Director Skinner (Mitch Pileggi) but with an additional wrinkle above them, Assistant Director Brad Follmer (Cary Elwes), once a sweetheart of Agent Reyes and anxious to rekindle the relationship. She and Doggett also grow closer during the season setting up the typical tension between the two alpha-males vying for her affection, but Doggett also has the consuming search for answers about his son’s death that preoccupy him in moments away from the X Files. Several of the season’s two-part episodes revolve around Scully’s son’s birth and subsequent safety, the latter involving a two-part storyline (“Provenance” and “Providence”) that has the baby kidnapped by alien cultists who have discovered another alien craft and feel William may be the key to gaining insights into the secrets it contains. All of these episodes offer Gillian Anderson a wide range of emotions to play as the loving, concerned, and forceful mother who’ll stop at nothing to protect what’s hers, and the subsequent episode “William” is certainly one of her career high spots as she comes to some heartfelt though terrible realizations. Back among the X Files, of course, are the usual array of unusual cases, everything from demonic mind control, a bug boy (with a neat twist ending to the story), a memory robber, a clever murder mystery involving a creature that mixes skinning with reincarnation, an angel of death physician, a child with a vivid imagination (very close to The Twilight Zone’s famous “It’s a Good Life”), God paying Earth a visit, and another case of psychokinesis (which involves, surprisingly, the Brady Bunch). The series finale two-part production features the return of the missing and presumed dead Fox Mulder (David Duchovny) now standing trial for the murder of a military officer even though there is no body to use for evidence. The trial enables the writers to regurgitate all of the various strands of the alien conspiracy hatched over the nine seasons of the show and offer a parade of cameo witnesses who get to take one last bow before the series ends. Robert Patrick and Annabeth Gish give season nine their all since they’re doing the heavy lifting of carrying the episodes, and both of their characters die or come close to death several times (Doggett drowns, is shot and paralyzed from the neck down, and run down by a truck yet survives fully intact by season’s end). Some other characters, of course, aren’t so lucky. The season does allow favorite heroes and villains from seasons past like the Lone Gunmen (Tom Braidwood, Bruce Harwood, and Dean Haglund), CGH Spender (William B. Davis), Jeffrey Spender (Chris Owens), and Alex Krycek (Nicholas Lea) to pop up (sometimes in quite surprising circumstances), and the guest star roles this year are filled by the likes of Lucy Lawless, Adam Baldwin, James Remar, Jane Lynch, Aaron Paul, Allison Smith, Kathryn Joosten, Terry O’Quinn, Don Swayze, Neal McDonough, Alan Dale, Stan Shaw, Burt Reynolds, Ellen Greene, Steve Ryan, Michael McKean, Michael Emerson, David Faustino, and William Devane. The episodes are presented in the widescreen television aspect ratio of 1.78:1 and are presented in 1080p resolution using the AVC codec. While there is more glamor photography this season than ever before resulting in softer shots alternating with sharper ones, generally the images are crisp and detailed. Contrast seems a bit more inconsistent this season than in seasons past. Color is rich and well-regulated with appealing and believable skin tones. Black levels are deep but much more natural in this season’s set than in the previous season’s release. The episodes have been divided into either 14 or 15 chapters. The audio tracks for the series are presented in DTS-HD Master Audio 5.1, and the program’s sound mixers really delivered outstanding soundtracks this year with impressive atmospheric effects placed interestingly into the available surround channels and directionalized dialogue at very effective moments. The show’s memorable Emmy-nominated music by Mark Snow (the program’s only Emmy nomination for its final season on the air) gets a nice spread through the fronts and rears. Audio Commentaries: there are only three this final season, and by far the most interesting one is the one for “Jump the Shark” with the show’s three writer-producers commenting on the episode and their entire experience working on the series. Kim Manners spends his finale commentary mostly showing appreciation for the hard working cast and crew he worked with in directing over fifty episodes of the show while Chris Carter’s comments are sporadic with as many silent passages as commented-upon ones. Deleted Scenes (20:39, SD): ten scenes spread over the five episode discs in the set with optional commentary by Chris Carter and Frank Spotnitz. Special Effects Sequences by Mat Beck (7:32, SD): producer Paul Rabwin comments on special effects needs and shows the execution for episodes on the five episode discs in the set. Reflections on “The Truth” (13:12, SD): all of the key cast members and the production team express their pride and gratitude for a satisfying nine seasons of working on the show. Wondercom Panel 2008 (26:48, SD): a question and answer session from Comic Con in 2008 featuring stars David Duchovny and Gillian Anderson and producers Chris Carter and Frank Spotnitz discussing the series and teasing the feature film they were in the process of making. The Truth About Season 9 (20:44, SD): director Kim Manners, writer-producer-director Frank Spotnitz, creator Chris Carter, producers Paul Rabwin, David Amann, and John Shiban, writer-director Vince Gilligan, director of photography Bill Roe, composer Mark Snow, production designer Corey Kaplan, visual effects artists John Wash and Mat Beck, and actors Robert Patrick, Cary Elwes, and Burt Reynolds recall highlights from the final season of the show. The Making of “The Truth” (1:07:45, SD): an elaborate documentary offering a comprehensive behind-the-scenes look at the making of the series finale including views of Kim Manners discussing upcoming shots he wanted, location scouting, the table read, storyboard meetings, behind-the-scenes hijinks, the celebration of the airing of the show’s 200th episode, staging and shooting various sequences, a meeting to discuss special effects needed for certain scenes, the post production work, and the wrap party. Secrets of The X Files (42:56, SD): a television special which aired after the end of season two summing up the conspiracy theories shown to that point. More Secrets of The X Files (45:05, SD): another television special shown prior to the season four premiere summarizing the conspiracy storylines to that point. Mitch Pileggi narrates. Reflections on The X-Files (17:42, SD): a special featuring actors commenting on their fondness for the show or their work on the show during its nine-year run, Among those commenting are Kristen Davis, Donal Logue, Cher, Kevin Smith, Seth Green, Bryan Cranston, Martin Landau, the Dust Brothers, Alex Trebek, Ed Asner, Burt Reynolds, Paul McCrane, Mimi Rogers, Peter Boyle, and Kevin Weisman. Threads of Mythology: Super Soldiers (26:59, SD): the alien conspiracy thread which dominated the show’s final two seasons is summarized by writer/producer John Shiban, director Kim Manners, writer/producer Frank Spotnitz, and actors Robert Patrick and Annabeth Gish. X Files Profiles: Monica Reyes (6:46, SD): producer Frank Spotnitz and actors Annabeth Gish and Robert Patrick discuss how Reyes fit into the plotlines for the final season. X Files Profiles: Brad Follmer (7:46, SD): director Kim Manners and actors Cary Elwes and James Pickens, Jr. discuss the character of Brad Follmer and his agenda for the character in season nine. TV Spot Ads (11:02, SD): thirty-nine promotional spots for season nine episodes as they aired for the first time on Fox. Season nine was not a sterling final season for the The X Files with some unsatisfactorily wrapped-up plots and some characters left in limbo. Still, the show offered above average thrills and spills for nine seasons and a feature film look to the show that very few dramatic programs up to that time could emulate. I think the season seemed to sputter to the end when it was first broadcast, but watching on home video it seemed to be better than remembered. One correction, "Secrets of The X-Files" aired immediately before Anasazi's original broadcast in 1995. I enjoyed this much more having watched the entire series again over the holidays (in preparation for the short revival we're in the midst of). What stood out to me perhaps more than anything was just how compelling a character John Doggett was – and how invested and top-notch Robert Patrick was in that role. I've always found it a shame that the series did not continue with he and the lovely Annabeth Gish (Agent Reyes) front and center. Thanks for the reviews, Matt. I've enjoyed them. Indeed, I appreciated Doggett quite a bit and did not really miss Mulder all that much. What stood out to me perhaps more than anything was just how compelling a character John Doggett was – and how invested and top-notch Robert Patrick was in that role. Thanks for these fine in-depth reviews of the complete series. Your reviews are an achievement in themselves. The work is appreciated. Thank you, Alan. As only a sporadic viewer of the show during its actual network broadcast, most of the episodes and storylines were new to me, so it was an adventure actually going through the journey with these characters. And I assume I'll be covering the new mini-season that's being shown now (which I am already watching) once it's released on home video (hopefully Blu-ray).